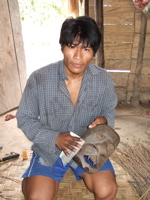 In our shop, we work directly with approximately 80 artisans from the town and from 14 communities around Rurrenabaque, and we manage production and sale of different sort of natural handicraft. 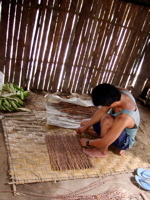 Let us introduce you three cases of handicraft-making activities. 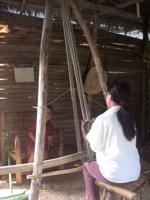 In the community of Nuevos Horizontes, near from the town of Rurrenabaque, the immigrants from highland such as Quechuas and Aymaras live together with the original people from the area. 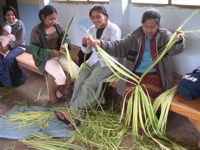 Approximately 20 women of the community join to the association of craftwomen, which is called 'Tres Palmas (Three Palms), and they dedicate theirselves to weaving of three types of palm leaves, jipi-japa, palma real, and chonta. 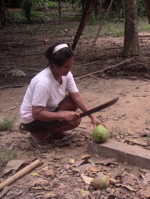 These activities does not only help economically their family and the community, but also raise their self-esteem and encourage, and they result in social independence of the women. 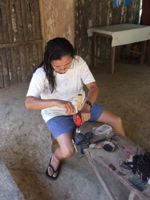 In the community of the natives Tacana, Bella Altura, a lot of family are dedicated to handicraft of carving of chonta, which is a palm tree with black, hard and beautiful trunk, and of coconut. 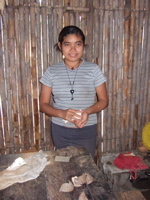 While in many communities of the natives that are located near the town they had too much influence of spanish culture and northamerican culture (for example, t-shirts and jeans) and they have been losing their way of traditional life, in some communities the conscience of protection of their culture and pride about their ethnical identity has appeared through the handicraft-making activities. In the community of Quechua-Tacana, San Jose de Uchupiamonas, going up the river approximately 10 hours by boat from Rurrenabaque, there are artisans who are dedicated to handicraft-making of root of Bibosi, a kind of huge tree from the jungle, carving animals that habit in the same jungle, such as monkeys, alligators, jaguars, wildpigs, turtles and birds, and also masks of the animals and human. These works are ecologically sustainable because they use a part of root instead of cutting tree. Also there are children who make ecological greeting-cards of recycle-paper that is made of paper which the tourists who visit the community by the eco-tourism program leave there and decorated with leaves and flowers from the area. Apart from these cases mentioned, there are many more people around Rurrenabaque who work for handicraft-making activities.